Speak Up to Protect Your Job and Your Retirement! The House Budget Committee is currently weighing a budget handed to them from the White house, which includes deep cuts to your pay and benefits. The final federal budget bill is slated to be released from committee to the full House next week. Get ready to make some noise. APWU is leading the charge against these cuts as part of the Federal-Postal Coalition in a Day of Action on Tuesday, July 18. Next Tuesday, tens of thousands of current and former federal employees are planning to call their representatives in Congress, to speak out against parts of the White House budget that hurt federal workers and retirees. The country-wide call-in’s success depends on you. 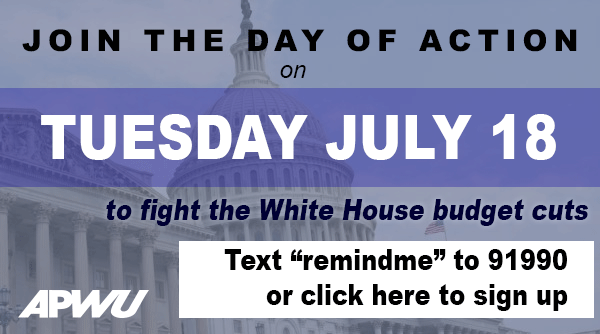 On Tuesday, July 18, we’ll be asking you to call 1-844-402-1001 and tell your Representative in Congress to vote NO on the White House budget. Together, our united voices CAN make a difference! Calling for an increase of 6% employee pension contributions into FERS - 1% a year for each of the next six years, which amounts to pay-cut of thousands of dollars a year for each FERS postal employee. Eliminating Cost of Living Adjustments (COLA) on FERS retirement benefits , reducing COLA on current civil service retirees and a change in calculating future retirement benefits from the current "high three" average to a "high five" year formula. Taking away the social security supplement for FERS employees who retire before they are eligible for Social Security benefits. Calling for massive cuts to programs workers rely on, including to social security disability benefits, Medicaid coverage, the Children’s Health Insurance Program (CHIP), the Supplemental Nutrition Assistance Program (SNAP) and the student loan program. Proposing $46 billion in “savings” to the Postal Service by a reduction in the methods of delivery. This could include cutting the number of delivery days and a further reduction in service standards. "These cuts are being made on the backs of workers," said President Dimondstein. They rob hardworking Americans to line the pockets of the country’s multi-millionaires. Worried you’ll forget to call? Click here to sign up for a reminder text and/or e-mail with the number. Don’t forget to tell all your friends to call! Click to share on Facebook and Twitter. Click to download and print a flyer about the Federal-Postal Coalitions’ Day of Action with talking points to pass out in the community and post on bulletin boards. Unite with us! Your livelihood may depend on it.